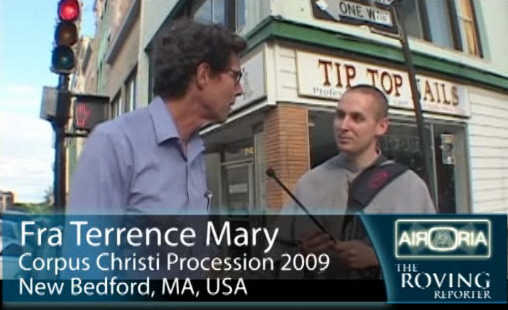 Here Friar Terrance approaches some of the bystanders as we process our Lord through the streets of New Bedford. Previous PostJun 18 - Homily - Fr Angelo: No Babbling! That photographer looks like a reporter. Check out what’s in his shirt pocket. Maybe you friars will be on nightline soon. LOL Wished I could have been there. Great Job Fra Terrance! You have a wonderful way with people. I prayed to St. Joseph to obtain for me the grace to be able to put people at ease like you do. You have a great gift. Wonderful procession – good people in New Bedford. After I saw your video I tested your technique with my brother (a tough customer) by offering him a miraculous medal. He said “ok thanks” and said he would say the prayer once a day! (I will pray for him too) Victory!